We are all about incorporating natural elements this year! For the past few years, we've seen a lot of painted cabinets and furniture. We're excited by the comeback of natural wood in 2017. By adding natural wood in finishes and furniture, you create warmth and texture while achieving a classic look that's cozy and inviting. Danish cabinets for the win! 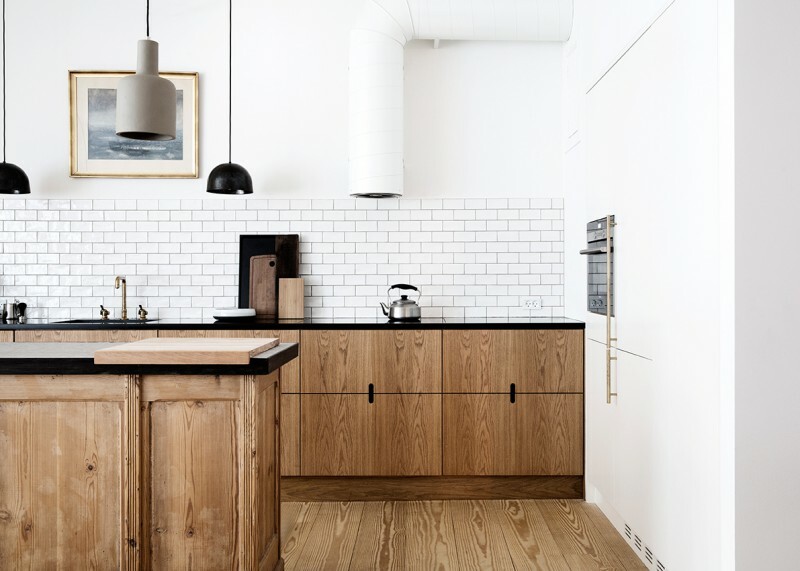 We love the minimal color palette with the textured wood and dark countertops. The natural wood finishes in the doors and floors in Lauren Conrad's home are too good to ignore. It's a classic canvas that's full of character and depth. It's beautiful as is, but I can only imagine how great a vintage runner would look on those floors! Bright walls, vintage textiles, and dramatic greenery are enhanced by the dark wood beams on the ceiling in this Living Room. We love the retro pattern and rustic texture created with all the wooden details from El Cerro Lane. This desk from our Windsong Project is full of natural touches. The open wooden shelves look so good paired with the woven basket, metal chair, florals and the textured accessories. Reclaimed oak and plaster walls were made to go together! We love Patrick Printy and Dan Hollands home in Sonoma County. This space is so inviting!! The combination of light wood with pastel hues and copper details make this kitchen by Claire Zinnecker naturally whimsical. We love the regal mood the wooden walls create in this space by The Makerista. Don't miss the frame either – we love how she rocked wood on wood! The natural oak in this built in shelving pairs so good with the white oak floors and bright details in this space! We love this bathroom from our Modern Mountain Home for its wooden paneling! It brings in the rich texture and visual interest that this all white bathroom needs. Pine shiplap ceilings create a warm earthy feel in this cottage. We love a space that's cozy and warm while being bright and lively! This open shelving from our Windsong Project pairs beautifully with the color blocked wall and kid themed accessories and toys. It serves as efficient and sturdy storage as well. That's what we call form and function! This room with a view is fit for relaxation with the wood details in the ceiling and floor. They make the space so warm and serene, we just want to hang in those rattan chairs all day! With a dark wall and a saturated rug, the wood desk from our Claybourne Project keeps the room soft and adds an element of comfort. A dark and moody bathroom feels clean and natural with the wooden vanity and marble top. Proof that you can make a dark, small space feel open and inviting! Natural elements galore in our Lynwood Remodel! With a woven rug, cow hide, and that gorgeous leather couch, we had to have a wooden detail! This coffee table is so bold, and it's worn texture and tobacco wash coordinates with everything from the pillows to the lamp. We added shelving here not only to create storage, but to add instant height and texture. We love how it looks with the natural details like the floral artwork, marble, and the little succulent plant. Our Pacific Palisades project is coastal and preppy, and the coffee table's light wood and twisted details is reminiscant of a day at the beach.